Excited to own your own MultiQuad? 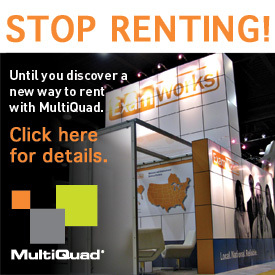 Now that you have a good understanding of the MultiQuad exhibit system, you are ready to make an educated purchase. We have some options for you. 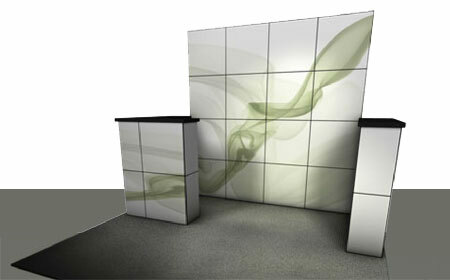 Select your next 10’ x 10’ or 10’ x 20’ MultiQuad from our collection of pre-designed kits. Each kit contains a full listing of the components along with full pricing. Even if you decide not to purchase a kit, it is a great learning tool to visually see how the components create the exhibit. 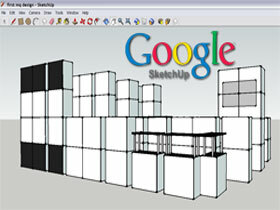 Flex your design skills with Google SketchUp and create your own MultiQuad from a imported collection of MultiQuad components. Simply choose to import the MultiQuad components from Google’s 3D Warehouse into your SketchUp and you are ready to start designing. Move components around and work out an layout arrangement that meets your needs. When you are ready to get pricing, save the design and send to your sales representative for an accurate quote. You can also reduce design fees for an order, by exporting your design from SketchUp in a format our designers can directly build your MultiQuad from. Our team of in-house designers can create a MultiQuad design that works for your new marketing message. From a 10’ x 10’ to a 100’ x 100’ we can create a digital rendering of what your new MultiQuad would look like when complete. 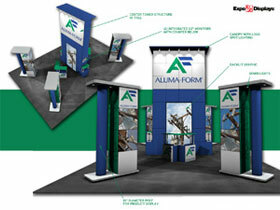 Contact your local Authorized ExpoDealer to schedule a design consultation. Our designers will listen to your marketing goals and help you create an exceptional MultiQuad to meet all your expectations. Don’t know the Authorized ExpoDealer for your area? Contact us at 800-FOR-EXPO and we can match you with one in your area.